Though I’ve tested hundreds (thousands?) of products since 2010, one thing I try to keep consistent is the types of products in my skincare routine. For morning skincare, I use a mix of products designed to keep oiliness at a minimum and protect my skin from the elements. While this post isn’t meant to deliver product reviews, you can easily see some picks from these categories on my favorites page. During my morning shower, I like to wash with a gentle cream cleanser. Sometimes I use only my hands to massage in the cleanser. Other times I will apply to a konjac sponge to get a little extra exfoliation. My morning cream cleansing routine assumes that I was diligent about my evening routine the night before (yeap, there are still occasions when I am too tired to wash my face — the horror!). If I was bad, then I’ll use a quick cleansing balm and then follow up with a gentle gel cleanser instead. No one ever gives you a simple answer about exfoliation. And I’m not about to start. How often you exfoliate is absolutely up to you — and it should be driven by a deep understanding and recognition in your skin’s condition. If you tend to get flaky like I do in the winter and early spring, you may want to exfoliate more. How much more? Well, again … it depends. Overdo it and risk irritation. Underdo it and risk flakies that won’t budge. Every other day, I’ll use a physical exfoliant (think scrubs) and adjust as needed. The other way to exfoliate, of course, is with acid toners. I save strong acids for my evening routine and very rarely use mild acids in the morning. That said, I have alternated physical exfoliants with mild acid toners in the morning if I feel like my skin is lacking in the radiance department (and I have extra time to let the acid toner dry before applying more products). Look for a guide to acid toners soon. Need recommendations? See my “Ultimate Guide to Face Scrubs for mini-reviews. This is a non-negotiable in my morning skincare routine. Hydrating toning sprays prep my skin for the moisture that comes next, and I love the ritual of misting my face. I prefer mists with very fine, large sprays that deliver an even distribution to my face — no target-toning, please! Hydrating toners are also critical to my daily skincare check-ins (yes, I keep a bottle of mist on my work desk) to keep my skin looking and feeling fresh. Finding the perfect vitamin C-based oil treatment has been my obsession. In the spirit of attempted minimalism in my skincare (ha, I’m doing so well, eh? ), I’m searching for a clean facial oil that contains vitamins C and E plus ferulic acid for maximum antioxidant benefits. The combination of C, E and ferulic increases photoprotection to the skin, meaning less oxidative stress and more protection from the elements. I’m searching for a wonderful oil (vs. watery or gel-like serums) in an effort to minimize product layering and chance for product pilling once my routine is complete and it’s on to makeup. However, for colder weather, I’d like a vitamin C serum that layers well under a thicker cream or balm that I may use during the day. Find my vitamin C skincare reviews in the archives. I rotate (and oftentimes omit) creams, balms and dedicated sunscreens in my morning routine. During colder or transition weather, my skin usually needs moisture from a cream or balm. I’ll apply the cream or balm after toning and then layer a light vitamin C oil on top to seal it all in. During warmer weather, I sometimes prefer a single cream for my skin-hydrating needs. No oils necessary (and now you see where that thin layer of vitamin C serum — underneath a cream — fits into the picture). When it comes to SPF, I wish I could say that I’m religious about it. I’m simply not. Instead, I avoid sun exposure as much as possible (easy when you work inside an office all day!) and am cautious about using sun protection when I will be in direct sunlight more often. And I know you aren’t supposed to use this as an excuse, but my foundation of choice is SPF 25. On days when I’m wearing mineral (or minimal) makeup, I’ll choose a dedicated SPF lotion to protect my skin. I’m equally not as diligent about using a separate eye product in the morning, but if I feel like my eye area is parched, I’ll tap in some serum or cream. During warmer weather and most of the year, I prefer a fast-drying, gel-like serum. For colder weather, I can sometimes get away with a cream or balm, but I typically like to save those (and oils) for the evening. 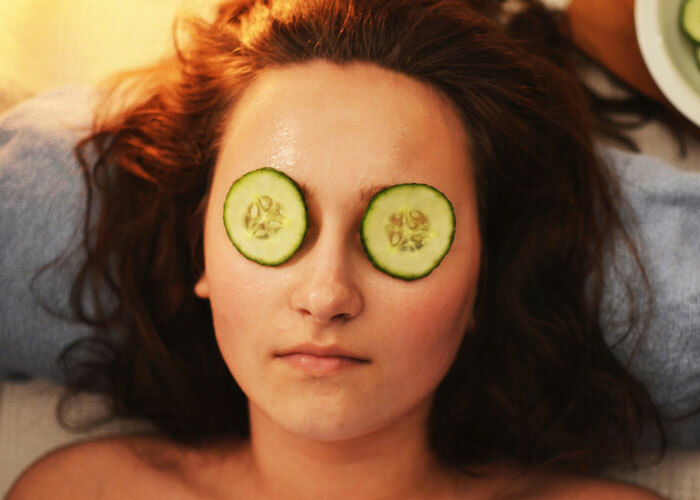 If you’ve got a great face oil or cream, you may not really need an eye treatment. It’s all about preference and skin sensitivity. In the past, I’ve developed milia around my eyes from using too-rich facial creams (and eye creams!) in that area. Again, it’s all about some smart experimentation an attention to how your skin is reacting. See my reviews of eye balms, eye creams and eye oil serums in the archives. Who else is addicted to lip balm? While this isn’t a crazy product category to labor over, I do have preferences around the consistency of lip balms that I use during the day. When prepping my lips for color, I prefer a creamy yet light lip balm that isn’t slippery and doesn’t overly coat my lips. It needs to deliver moisture but stay put; many lip balms I’ve tried feel shiny and oily, which leads to lipstick messes. The perfect lip balm also has to be soft and easy to glide. Some lip balms go to the extreme of feeling too dense and chalky, making them difficult and almost painful to apply. What product categories are in your morning skincare routine? What’s your take on vitamin C oils, creams, balms and SPF? Tell me in the comments!